Paparazzi are nothing new, in 1910 they were giving the Royal family heartburn, only then they were called Camera fiends. And Brittney, you weren't the first either. Read on to find out about Marie Corelli, the writer, getting out of a four wheeler in 1907. We regret to see that complaints with regard to the misuse of the camera by the well-named "camera fiend" are once more becoming unpleasantly numerous. At Cowes Regatta certain individuals seem to have made themselves an intolerable nuisance to the Royal family, who found their privacy interfered with at all times of the day by persons with cameras, who swarmed around the Royal yacht in launches. Worse still, it appears that attempts were made to photograph the King and the Prince of Wales while bathing, in spite of the fact that the photographers had agreed among themselves that no such thing should be done. Naturally, the type of person who would attempt prying of this nature would think nothing of breaking an agreement with his fellow-photographers, and no arrangement of this kind is of any avail with the true "camera fiend." Some other outrageous instances of misconduct are given by Mr. Ernest Human in a letter to one of our contemporaries. Three particular instances are given in detail, and while two are bad enough, the third is almost beyond belief. In this case a photographer, having obtained permission to photograph in a church, was eventually found perched with his camera and tripod on the top of the altar, from which he had cleared everything else. It appears that he was caught there by the rector who, we trust, was of the muscular persuasion. Behavior of this kind leads to the exclusion of photographers from churches and other buildings, while conduct such as that of the Paul Prys at Cowes produces regulations which bear severely on all photographers. Two other types of fiends: the bicycle fiends, or the "Cads on Castors," and the motor fiends or "Road Hogs," are kept under, not only by the police, but by their own Associations; and we suggest that photographers might very well do something to suppress their own particular brand of fiend. Photographic societies would be quite justified in expelling any member who disgraced himself in this fashion, and they would do good if they made it their business to investigate all instances that occurred in their own districts, and to report the offender to his own society. This might not lead to the punishment of the culprit, who very probably would not belong to any society at all, but it would at least serve to show the general public and those in authority that photographers as a body are not supporters of the camera fiend, and in no way tolerate his impertinences. If, as is sometimes stated, the camera fiends are mainly press photographers, we suggest that press photographers as a body would be wise to combine and endeavour to cope with the matter before their privileges become further curtailed. In any case, they are the people who suffer most from the camera fiend's misdeeds, and the matter is one that concerns them intimately. In all popular sports and photography is for the most part of the nature of one—regulations of a fairly severe and stringent type are necessary for the purpose of controlling the less ruly, and of punishing offenders, and the same thing holds good in professions. In photography, however, which is to some extent both a sport and a profession, no such regulations exist, and no one seems to have any power to punish. This is a defect that should be remedied, if photographers generally are to escape being looked upon with suspicion and distrust, and from being excluded from all places where the ill- mannered can give offense.—British Journal. "I am all for anonymity and everything that tends to the avoidance of advertisement. If people must ride in motors, let them have the decency to disguise themselves as effectually as possible, and shun all contact with their kind." Miss Corelli and a friend were caught at Shakespeare’s tomb by a press photographer. (It was said by her critics that she moved to Stratford to associate herself with Shakespeare. So a photograph of her visiting his tomb would only fan the fire started by those critics. You can see why she wouldn't want the photograh taken.) When the novelist became aware that she had been snapshotted she turned a lobster color, but a moment later, recovering her self-possession, she approached the photographer, smiling, and demanded a pledge not to publish the photograph. The man hated to give the pledge, but finally yielded to Miss Corelli’s blandishments. Then she gave him her hand and smiled wider than ever. While in the midst of the smile she heard the click of another camera. It appeared that another press photographer had made a group picture of the photographer, Mis Corelli’s friend, Miss Corelli herself, and the handshake and smile. “Come here,” said Miss Corelli to the offender. He came, and Miss Corelli wheedled a promise out of him not to publish the group picture. Miss Corelli thinks she may rely on the two pledges, but the chances seem to be the other way. The Jacqueline Susann of her time, Marie Corelli is historically significant in that her novels participated in the Victorian machinery of the “bestseller” and the author/star system, and indeed Corelli's fame at the turn of the century was rivaled only by Queen Victoria. 100,000 of her books were sold each year. In comparison, H.G. Wells sold a mere 35,000. The photograph of Miss Corelli getting out of a four-wheeler probably had more to do with "her image," than "the image," unlike Brittney. There are very few photographs of her, as she tightly controlled her public image. This same year she had written The Devil's Motor, a story in which the devil in smoked glasses drives a huge touring car around the world and is so shocked at human sin that he drives off the cliff with all humankind following his car to utter destruction. I'm sure you can imagine the inference. "Marie Corelli gained the admiration of quite a few celebrities: the Prince of Wales asked her to dine, Gladstone came to call, Queen Victoria ordered that all of Corelli's books be sent to Balmoral, and there were fan letters from Queen Margherita of Italy and from the Empress of Austria. She desperately fought to gain legitimacy in the world of art and letters, and she achieved a measure of success despite the scorn of reviewers. Oscar Wilde invited her to write for Woman's World, she was introduced to Browning and Swinburne, Ellen Terry adored her, and Lily Langtry asked to perform in dramatizations of her novels." The Camera Fiend, Photographic Topics, New York: Obrig Camera Company. 1910. Unknown. "Novelist Is Snapshotted." New York Times, 27 April 1910. Online Archive. KCLS Database - Subscription: 2008. Federico, Annette. 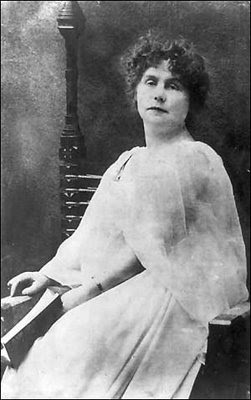 "Marie Corelli (1855-1924)." The Literary Encyclopedia. Online. KCLS Database - Subscription: 2007. Marie Corelli. Portrait Photographs, 1900 - 1910. Multiple Prints and Photographs Collections. Prints and Photographs Division, Library of Congress, Washington,D.C. Oh, dear old Marie Corelli! I have a few of her books and have even read them. Thelma is quite good fun (she invented the name for the heroine). her father Dr. Charles McKay, was the author of Extraordinary Popular Delusions and the Madness of Crowds (1841) which, given his daughter's popularity and overheated writing style, is sort of funny. I think there may be a joke in there somewhere, but I can't quite manage it today! This was such a great post, I loved it. Somehow I knew you would be the only other person to have read her work besides me. She's rather fascinating. Found very interesting her mid-life affair.